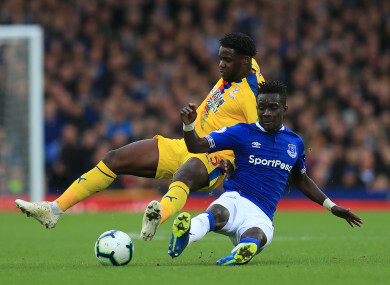 Idrissa Gueye battles for the ball with Crystal Palace's Jeffrey Schlupp. EVERTON HAVE TURNED down a bid from French champions Paris Saint-Germain for Senegalese midfielder Idrissa Gueye, said under-pressure manager Marco Silva. According to reports, PSG offered £21 million (€24 million) to bolster their options in midfield ahead of a return to Champions League action against Manchester United next month, with Marco Verratti an injury doubt and Adrien Rabiot outcast over his refusal to sign a new contract. However, Silva is in no mood to lose Gueye after a run of just two wins in Everton’s last 10 league games and a FA Cup exit to Championship Millwall on Saturday. “My opinion is the same as the club’s, and we rejected the offer,” said Silva. “He is a really important player for us. Should Gueye ultimately leave the club, it may lead to first-team opportunities for Irish midfielder James McCarthy, who is on the comeback trail from a horror leg break in January of last year. The Irish international was an unused substitute in Everton’s third-round Cup win against Lincoln City, but has not been involved in a first-team squad since. After a summer of heavy investment to back Silva in his debut season, much more was expected from the Portuguese than a return of 30 points from 23 games that leaves Everton languishing down in 11th. However, Silva refused to label Tuesday’s visit to rock bottom Huddersfield as a must-win to ensure he keeps his job. “I am not happy with the last month-and-a-half with the last run, but I am not panicking,” he added. “We as a club cannot panic. Even if we are not happy, even if the fans are really disappointed with the FA Cup result. Email “Everton reject PSG bid for midfielder Idrissa Gueye”. Feedback on “Everton reject PSG bid for midfielder Idrissa Gueye”.